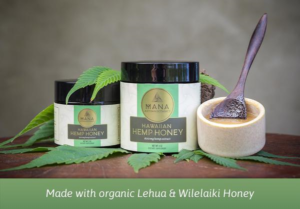 Hawaiian Hemp Honey is made with a mix of raw organic Lehua and Wilelaiki honey that is small batch infused with a phytocannabinoid-rich organic hemp extract. This Lehua honey is one of the rarest honeys available on the planet. Harvested from the Ohi’a Lehua blossom, an endemic tree on the islands of Hawaii. Wilelaiki honey is sourced from the christmas berry tree which thrives in the lower elevations of Hawaii. Hawaiian Hemp Honey contains 150mg of hemp extract per ounce. It has a rich floral aroma and creamy texture. Available in 2oz and 4oz sizes. Perfect to mix in drinks or just let it melt in your mouth.